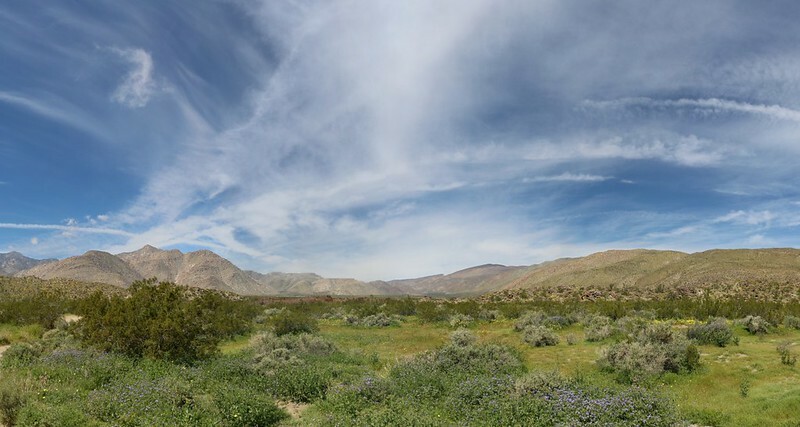 We took our time leaving our house in San Diego, as it was only a two hour drive to Borrego Springs. 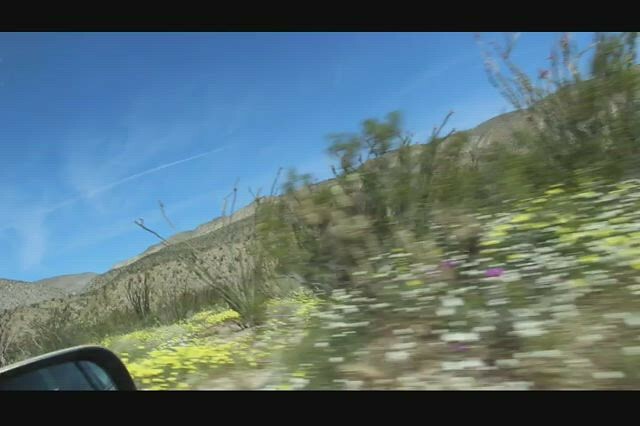 As we drove, we noticed that the coastal strip was already green and blooming, but in the higher mountains, Spring was barely beginning. They’d had a lot of snow up there three weeks earlier, and at this point only the baby grasses had begun to grow. We continued east, and as our elevation dropped, the desert began. 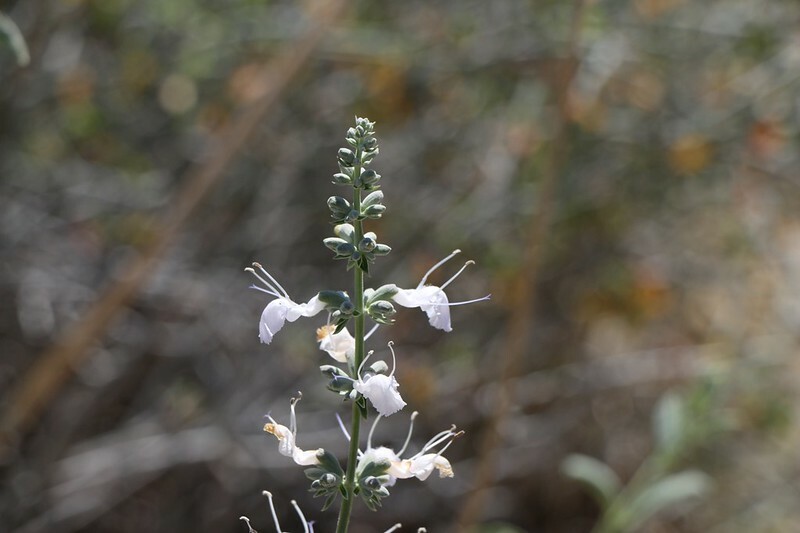 We began noticing green-tinged hillsides that were blooming with patches of yellow flowers. 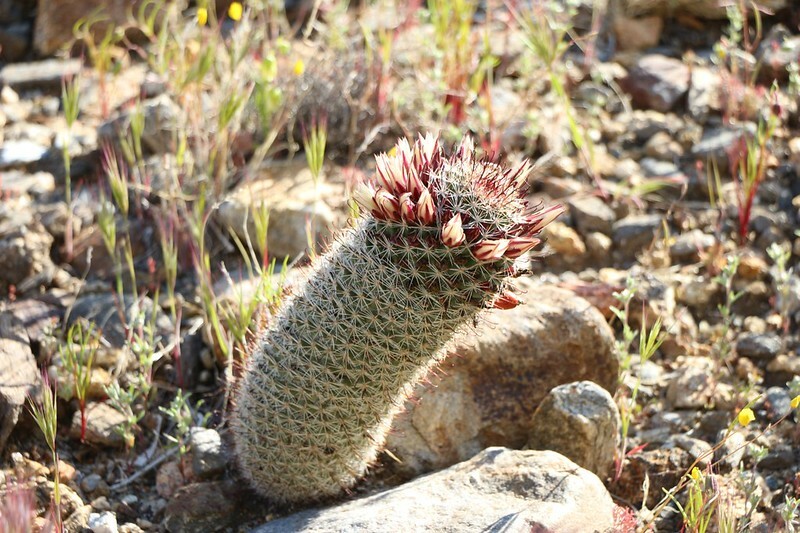 It’s usually so dead and brown in the desert, during a normal year. Vicki and I were amazed. We had to pull over at a turnout on Highway 78 and take some photos right away, even though we were nowhere near our destination. There were flowers everywhere. 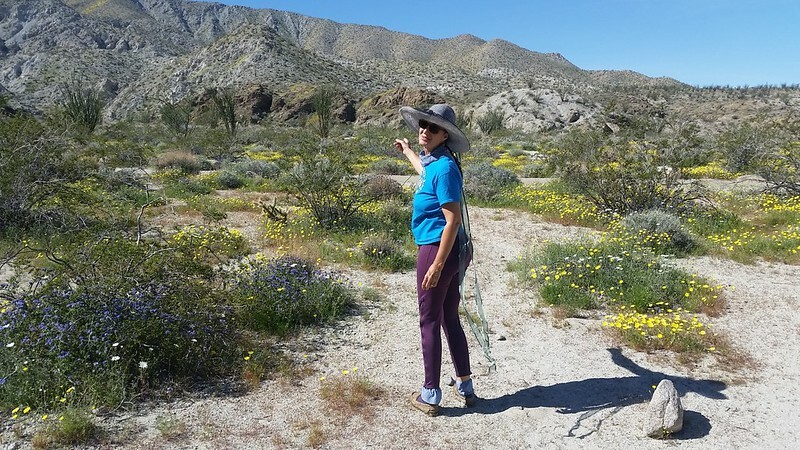 It really was a Super Bloom. 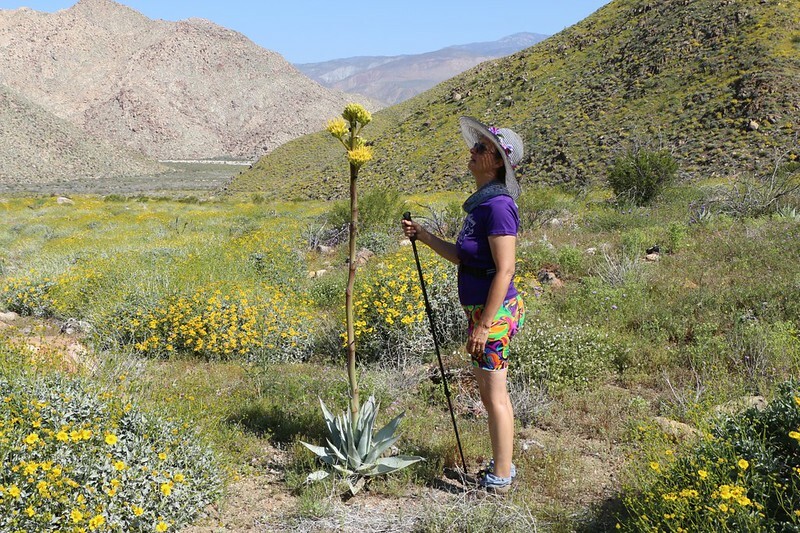 We continued onward to the city of Borrego Springs, and noticed that the amount of blooming varied from one spot to another, primarily depending upon altitude and terrain. Which wasn’t all that surprising. 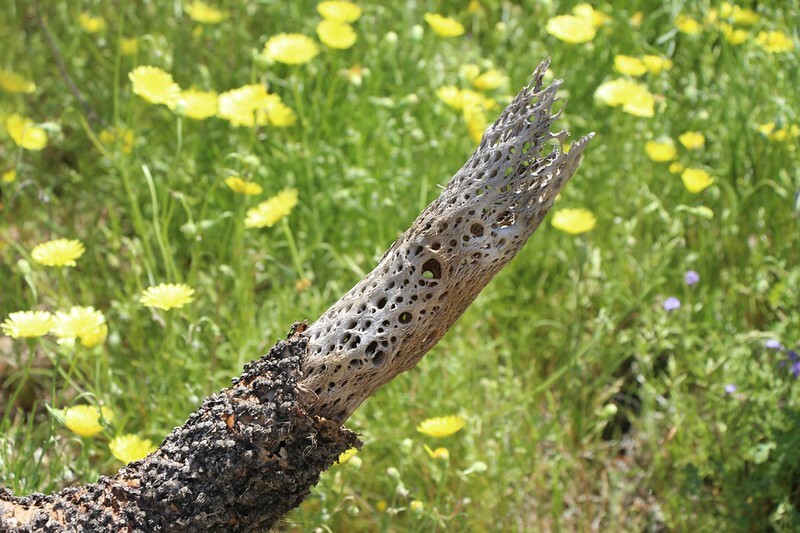 But it also made us unsure of what we would find once we hiked into the desert itself. Would we see the bloom at its peak? Or was it already too late? 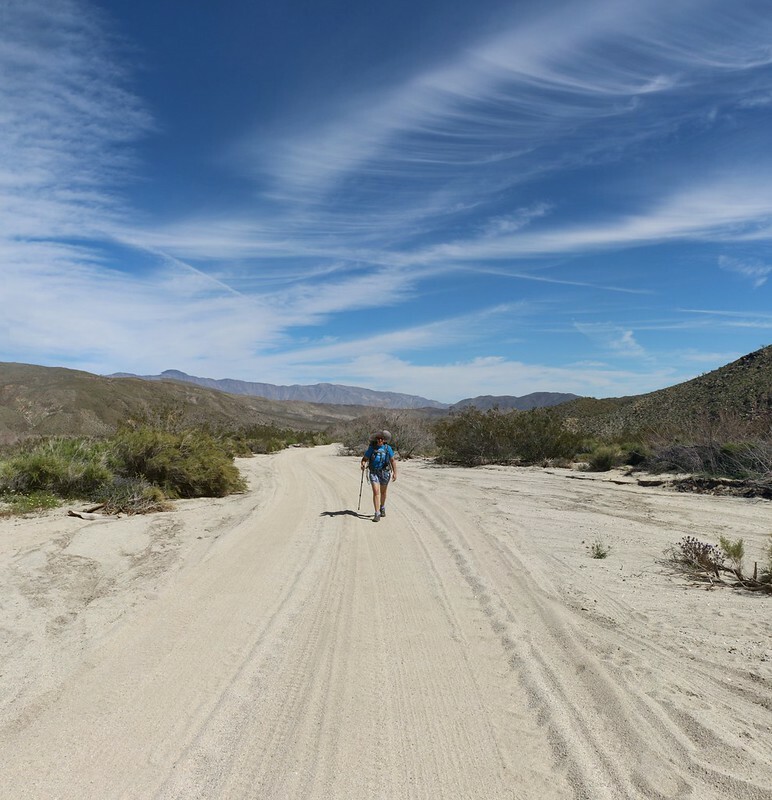 The third week of March is considered the best time, and we were here on the 23rd, so hopefully our timing would be OK.
We drove north of Borrego Springs on DiGiorgio Road, which turned into a dirt road as it crossed the park’s boundary. 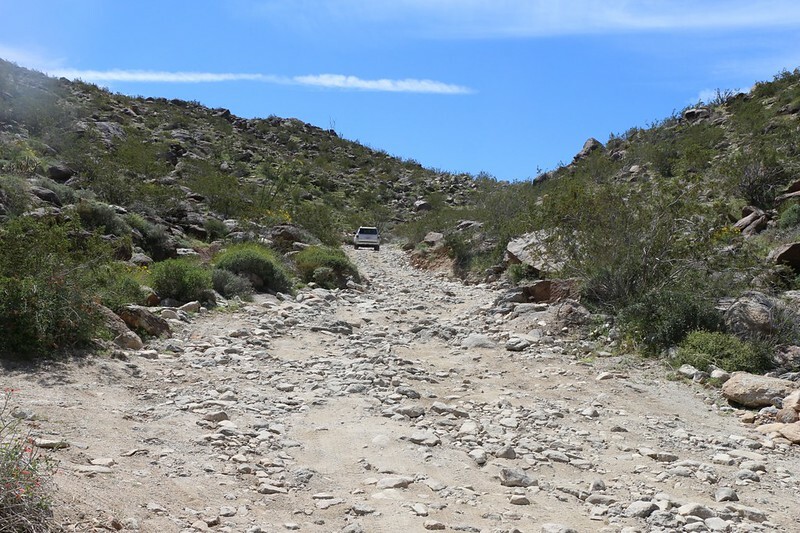 It was then called Coyote Canyon Road. This road followed the original route of the Spanish explorer Juan Bautista de Anza on his colonizing expeditions to Monterey in the late 1700’s. There were several monuments attesting to it along the road. 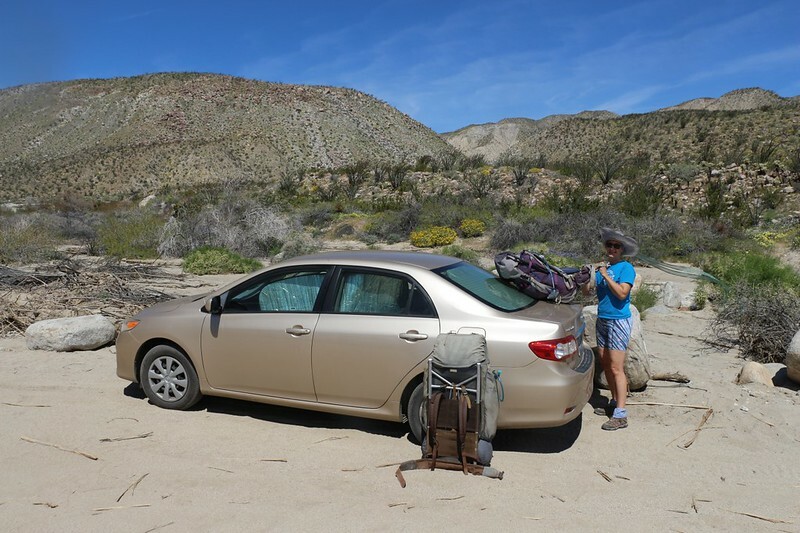 We were in a Toyota Corolla, a low-clearance sedan, so we had to drive slowly and carefully. But we were good at this by now. 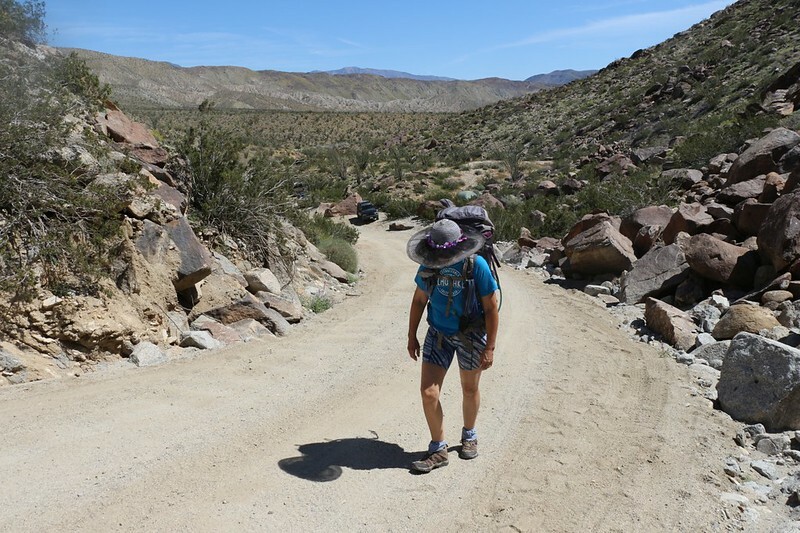 We crossed the still-flowing Coyote Creek twice and eventually decided to stop at the Third Crossing, which was about as far as we’d ever come down this road. After that, we’d be backpacking. So we parked the car and got ready to hike. We were pretty excited, because the flowers were out in full swing in this area. 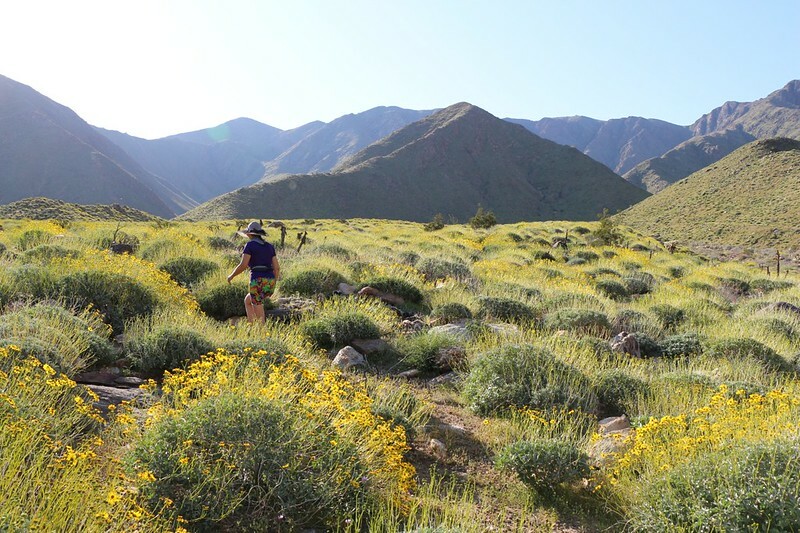 We hadn’t missed the Super Bloom, after all! View back to the car over part of Third Crossing. We stopped there because I didn’t like the look of those rocks. Within a hundred yards of the car, we began climbing. This part of the road ascended up a canyon and over a ridge. 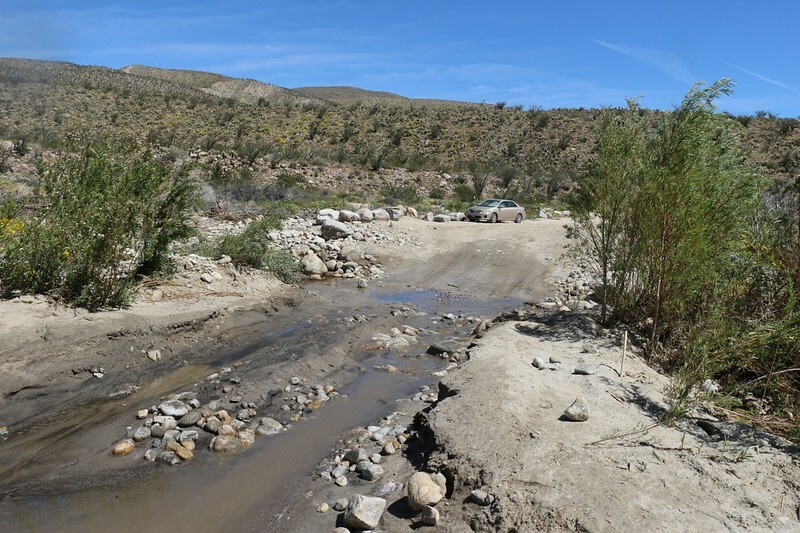 It was a way for 4WD vehicles to avoid driving directly through lower willows, a lush wetland along the creek, which is the way the road used to go before environmental considerations stopped it. In fact, in many places the road had actually been the creek bed itself, and this caused a lot of pollution in the water. But no longer. This new road was still tough enough for four wheel drive trucks, so everyone (including the flora and fauna) was happy. Vicki, however, was less happy. She really doesn’t like going uphill. She does it, of course, but she doesn’t like it. So we slowly climbed up the road. Luckily, there were plenty of flowers blooming everywhere, and they helped distract her from the climbing. We made it to the top of the ridge and took a break. There was a nice breeze up there, and some fine views west toward Sheep Canyon. We had explored that canyon (with its many waterfalls) back in 2012 and 2014 but it wasn’t our goal for this weekend. To tell the truth, we didn’t have much of a goal for this weekend. Our plan only extended to where we would camp today, at the mouth of Cougar Canyon, which we already explored way back in 2011. We figured to let the flowering blooms shape our plans for tomorrow. 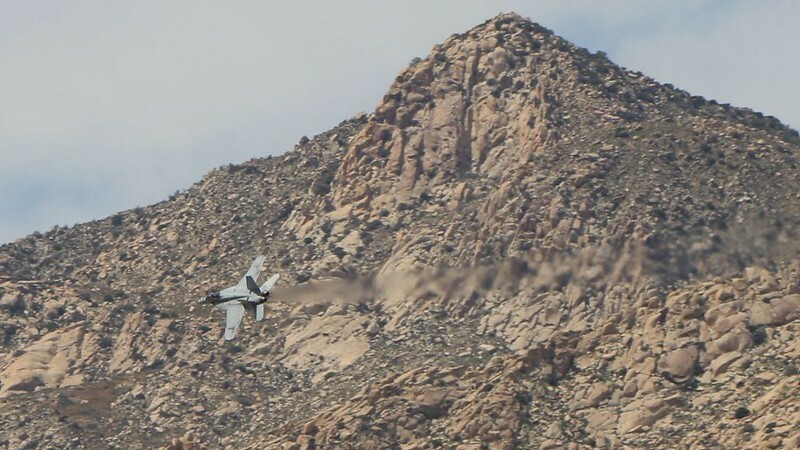 As we headed downhill into Collins Valley, we were taken completely by surprise by an extremely low-flying FA-18 fighter jet! It came screaming up behind us and roared by overhead, ripping the sky wide open with the sound of its powerful engines. It continued onward, banking sharply left, into the mouth of Indian Canyon, and in less than 15 seconds it was gone. I snapped a bunch of shots of it, hoping to get a clear one. It’s hard to get fast objects in focus. I love airplanes, and this was already the highlight of my day. What a thrill! After it vanished from sight, I turned around, and there was poor Vicki, off to the side of the road, with her hands clapped over her ears, the echoes of the thundering engines still reverberating around the valley. She hates those planes and how loud they are. It does something to her brain, I think. Plus, she’d initially thought it might be a souped-up 4WD truck bearing down on us from behind, so she really jumped. I went over and held her gently, until she recovered from the shock. 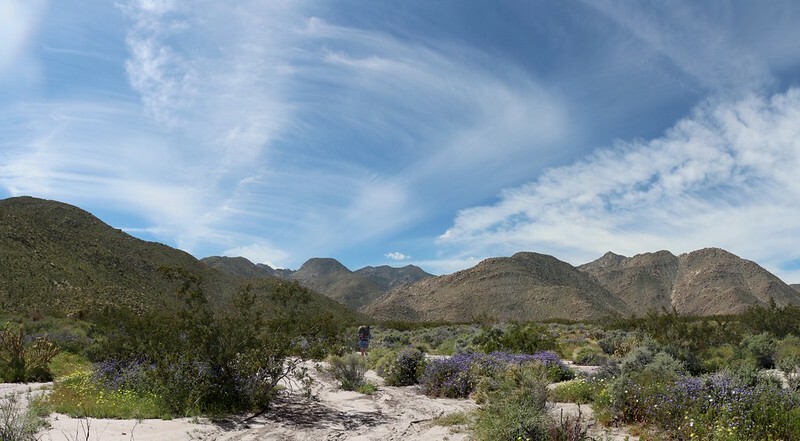 It all worked out OK; it was only the sudden loudness that caused her distress, and within a few minutes the adrenaline wore off and we were hiking along in the quiet desert once again. As we continued, we realized that we had truly come to the right place at the right time. 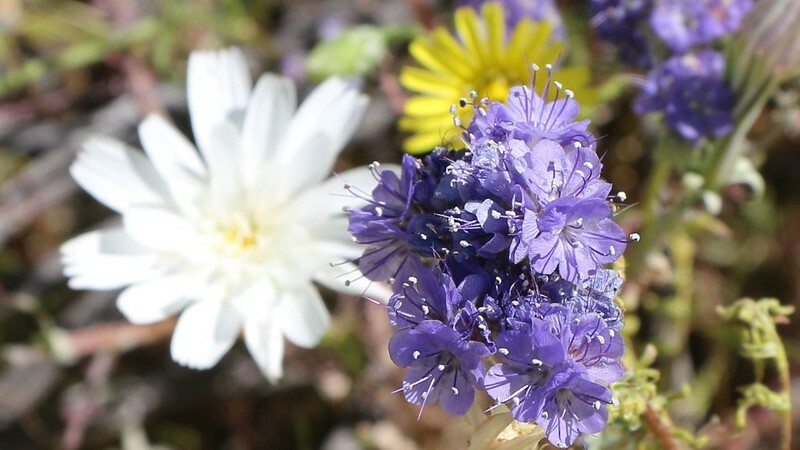 The Super Bloom was in full swing down there in Collins Valley. Everything was green. Or yellow. Or purple. Or red. Or, rarely, orange. At the edge of Collins Valley we left the main road and took the foot trail directly toward Sheep Canyon. 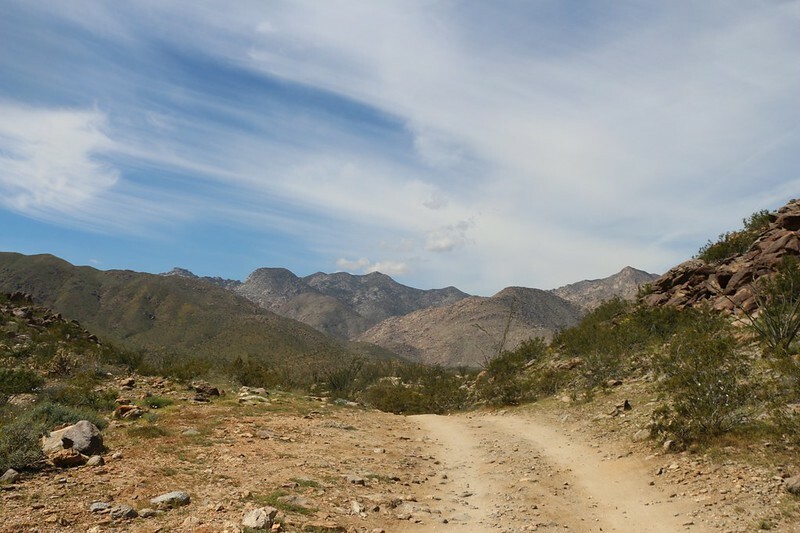 This trail wandered along the dry sandy bed of Indian Creek for about three quarters of a mile, roughly paralleling the road. It was peaceful hiking there, and we were happy not to breath dust clouds, while remaining constantly on the lookout for off-roaders. The sand was a bit soft in places, and we quickly became adept at selecting a route on the firmer ground. But, all too soon we were back on the road again. We followed the road across the big wash at Sheep Canyon, but stayed to the left until it ended at a parking area where the foot trail to Indian Canyon (and Cougar Canyon) began. We continued on this narrow trail, and soon we heard the sound of running water. Cougar Creek was flowing out into the wide, sandy wash, and it was sinking into the sand the whole way. 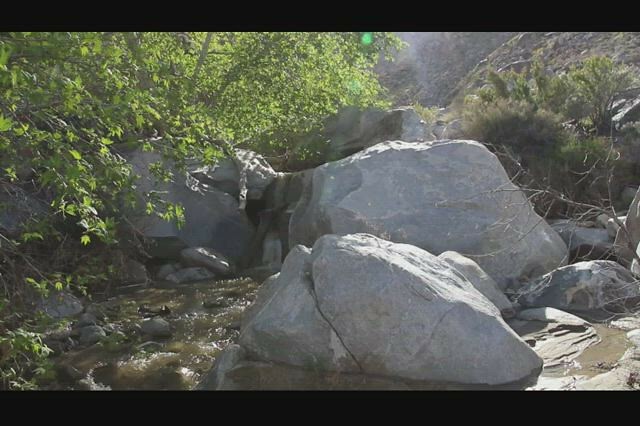 It flows all year, but mainly in the canyon where it’s so rocky. We were happy, as we would have good water to drink for the rest of the weekend. 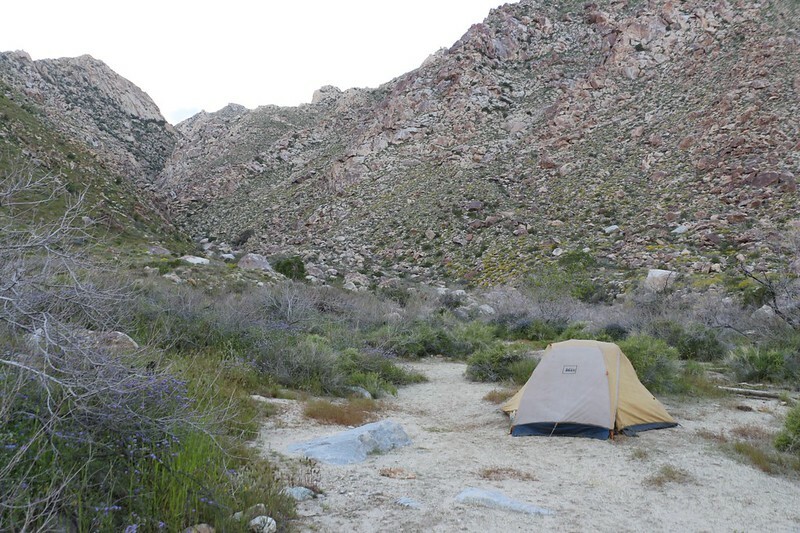 We set up camp in the mouth of Cougar Canyon. We seemed to be the only people staying here overnight, which made us happy. There were still some day-hikers coming down out of the canyon itself, but they didn’t bother us at all. 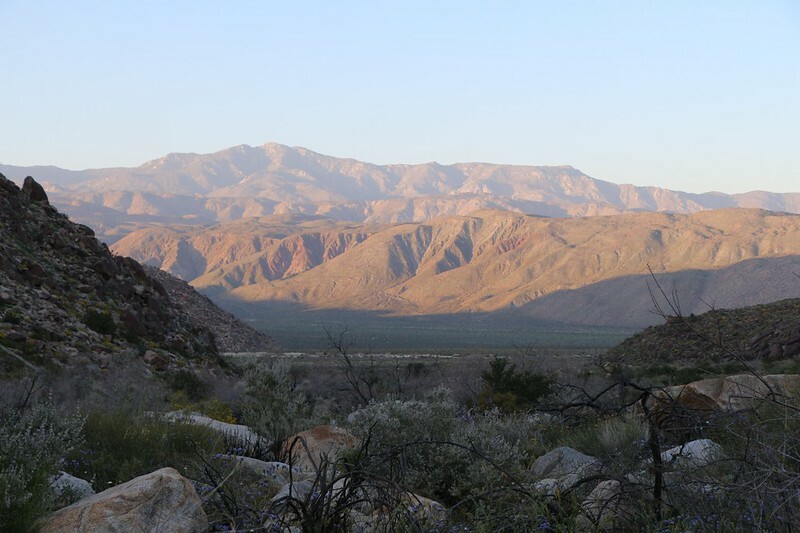 The air began cooling after the sun descended behind the mountains, and we got dressed in our warmer night clothing. Then we sat and ate dinner as the sun went down. It had been a mellow day, and we liked it that way. We woke up late and didn’t really care. We didn’t have much of anything planned for the day, except to wander around the area and check out all the flowers. Having no destination was a form of freedom, after all. As the sun rose and the air warmed up, we got ourselves ready for a day hike. 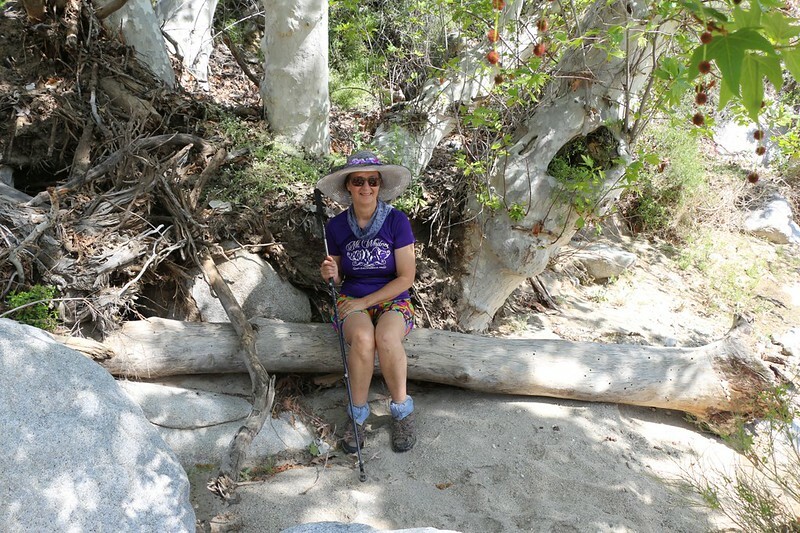 Water, lunch, snacks, and books to read were loaded into Vicki’s empty backpack, which I then carried. 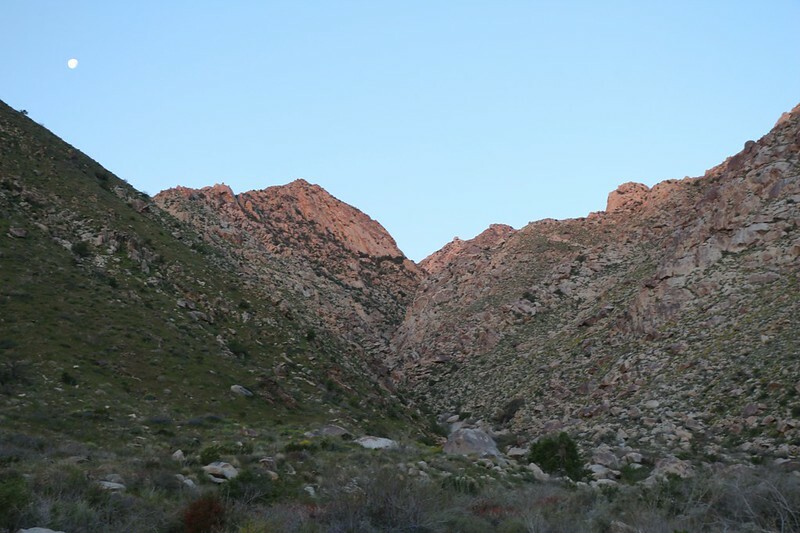 Then we headed off into the lower section of Indian Canyon, intent on checking out a side-canyon to the southeast. 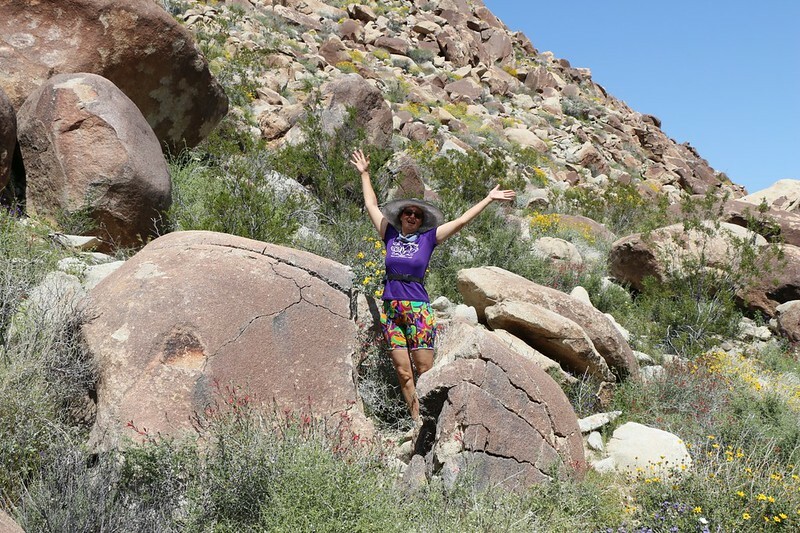 We’d already been up the main Indian Canyon trail, back in 2011, so we wanted to check out something new. And not too difficult. Yes, we were truly on vacation that day, with minimal goals. 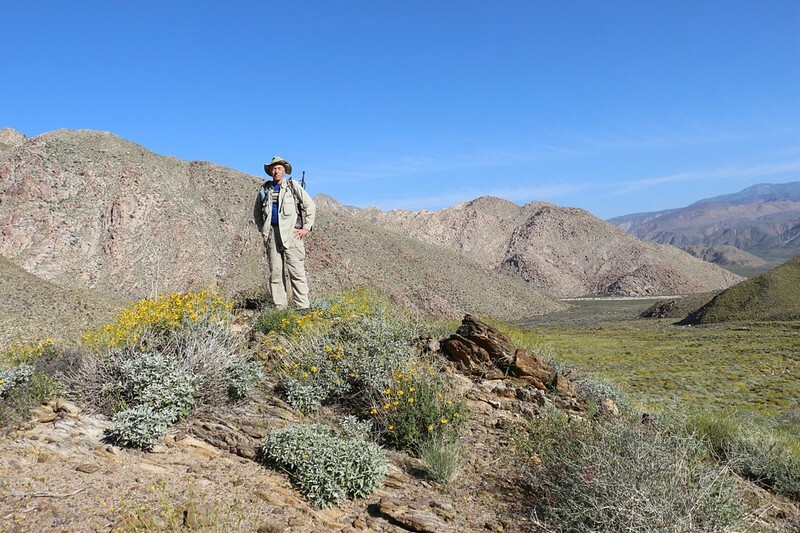 We climbed up a narrow, rocky ridge in order to check out the bloom from a higher perspective. It was worth it. We stopped and looked all around. 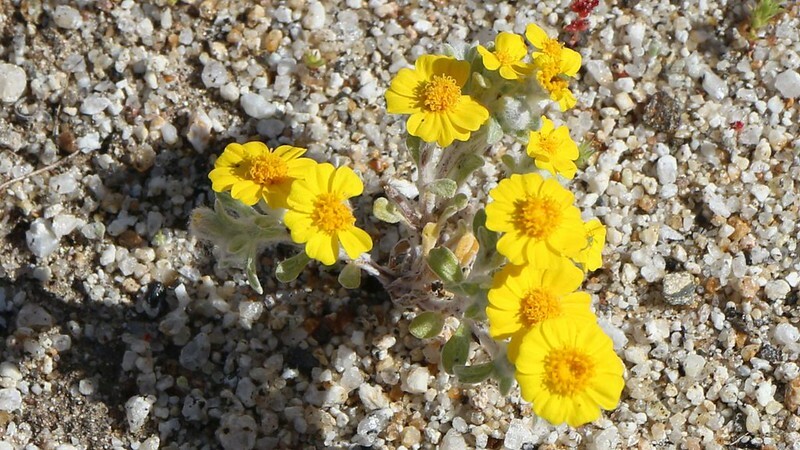 It was as if we were on the prow of a ship, sailing in a green sea full of yellow flowers. Panorama shot looking southeast from a ridge – it’s green and yellow everywhere! We continued onward, down the side of the ridge, and headed southeast, into the side canyon that ultimately leads to Peak 4155. But we had no real desire to climb a mountain. We decided to head that way and see if there was any water flowing in the wash at the bottom. A more modest goal. 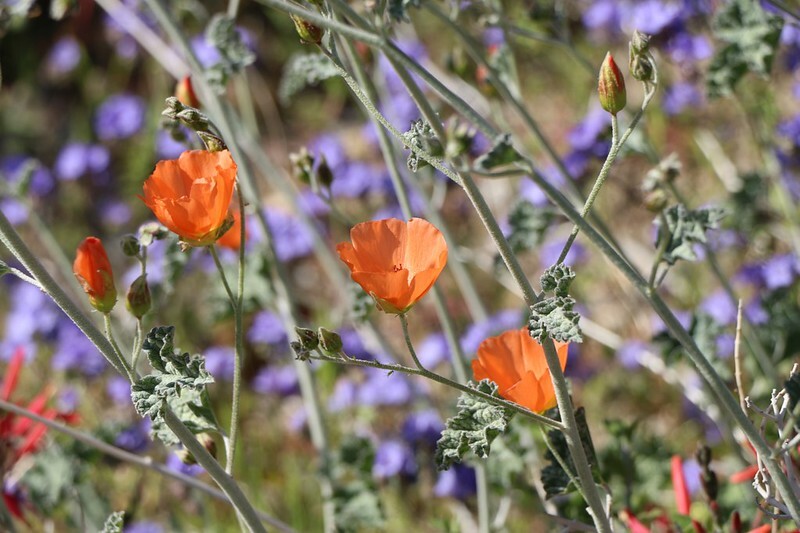 Orange Globemallow flowers. Orange flowers were quite rare out there. 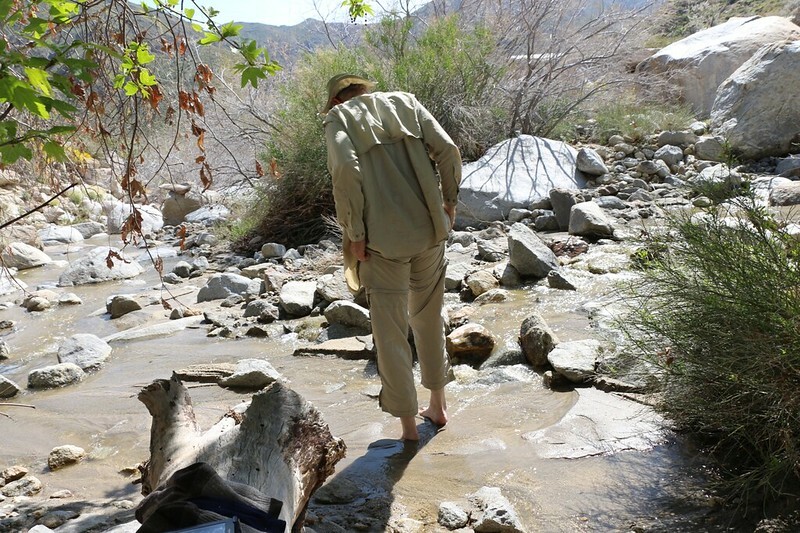 Once we were in the wash itself, it was obvious that it was bone dry, and we hiked upward in the soft sand for a while. 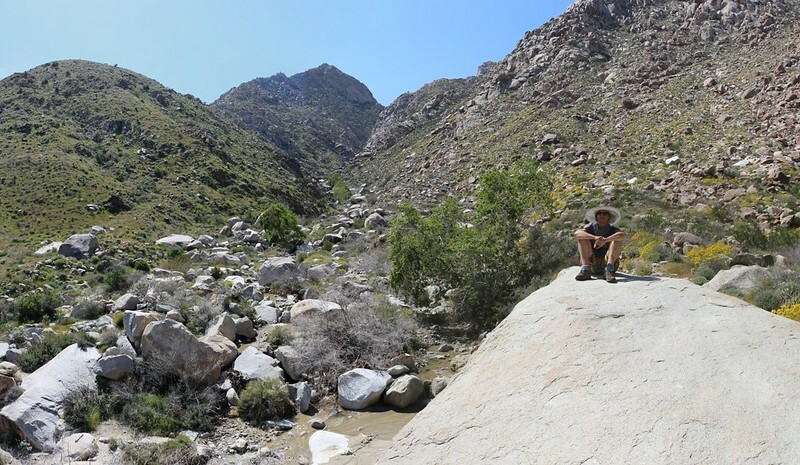 But the views are always limited down in the bottom of canyons, with mountainous walls rising on each side. Meanwhile, the sand was deep, making the hiking more of a chore. Going uphill directly into the hot sun didn’t help any, either. So we decided to turn around. 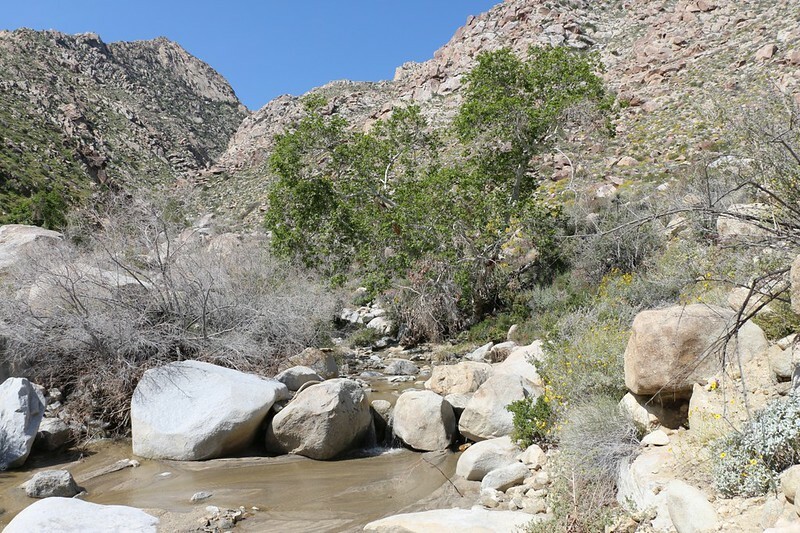 There were tall, shady trees and a cool, running stream back in Cougar Canyon. Something we could both agree on. Finally, we had a bona-fide goal. It was only 11am by the time we got back to Cougar Creek, but we decided to eat our lunch a bit early. We took off our shoes and let our hot feet cool off. There was plenty of soft sand in the stream bed to make them comfortable. We also dipped our feet in the cold water which really cooled them down. Then Vicki took her usual nap while I read my book, with the sound of flowing water in the background, and the smell of moisture in the air. We decided that sitting in the shade was wonderful, but we really needed to get at least a tiny bit of exercise. 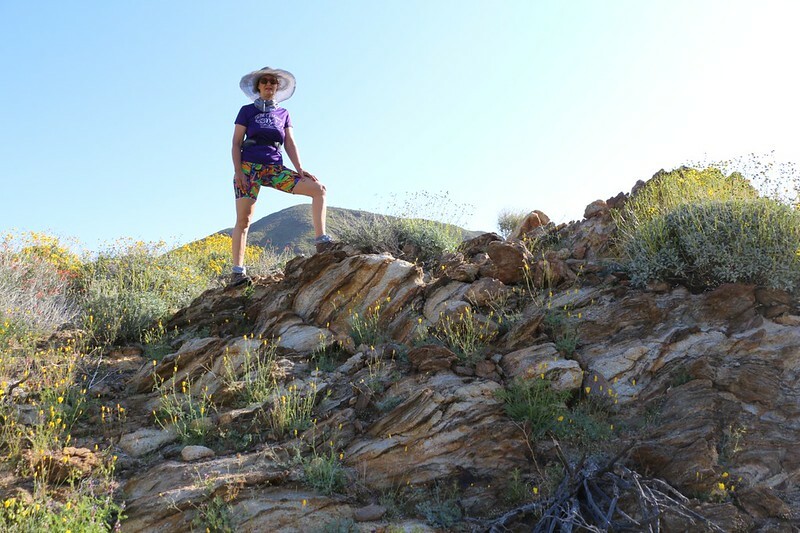 So we got up and wandered around the mouth of Cougar Canyon, climbing on boulders and looking for anything that piqued our interest, flower-wise. 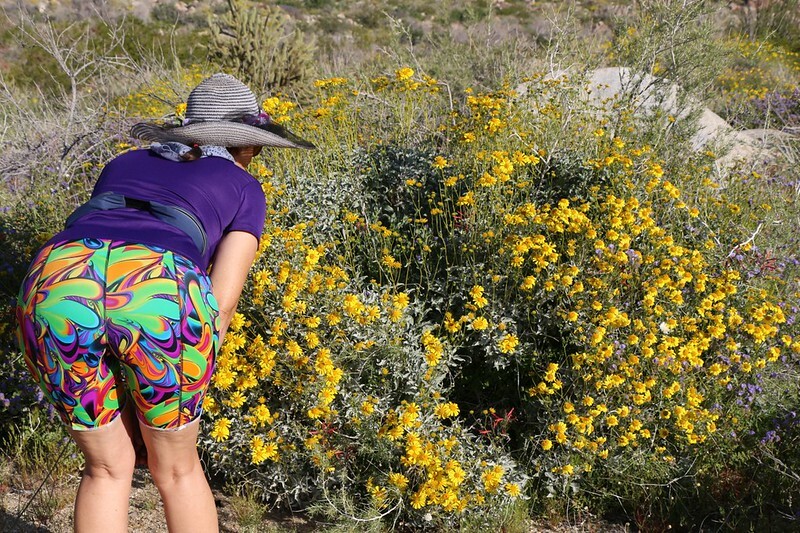 There were a number of catclaw plants in the area, so we kept our eyes open. Those things grab on and don’t let go, and will tear your clothing if you’re not careful to disengage from them methodically. We were glad that there was a nice breeze blowing, but it was still awfully warm in the sun. 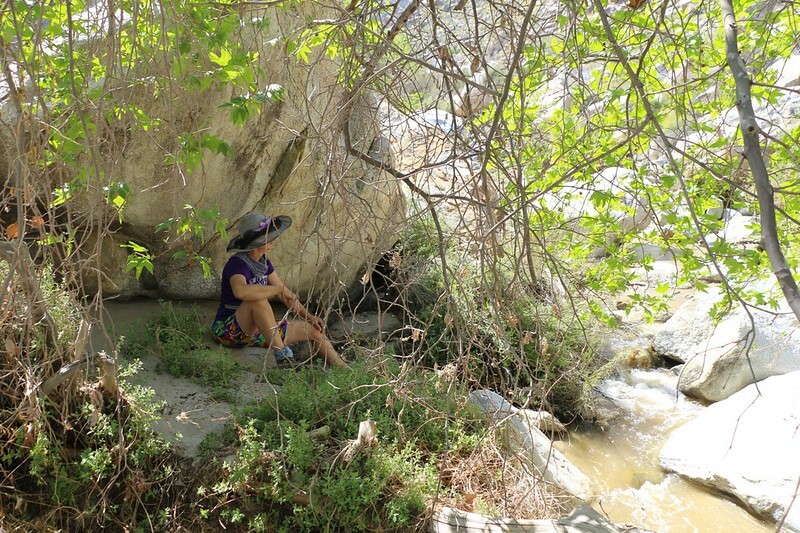 We headed upstream a bit further and found yet another shady spot under a different tree, next to a big boulder, and we read our books for a while. This was becoming one of the most peaceful and easy camping days we’d ever had. And we needed it. We hadn’t been camping in months. We headed back to the campsite but it was still sunny and hot. 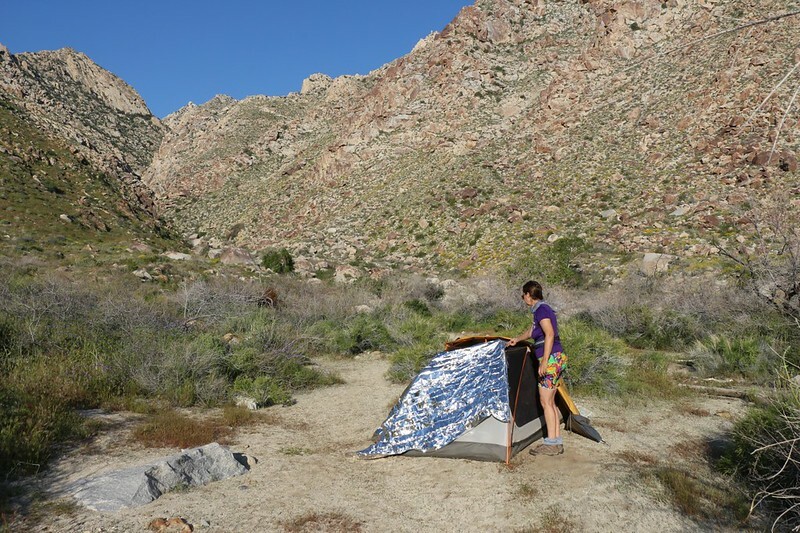 I told Vicki that I was going to sit in a tiny bit of shade near the creek, but she insisted on checking out the interior of the tent. She opened the doors for air flow and went inside. She claimed that the silver space blanket had actually made it tolerable in there. And she took a third nap! Napping must be her superpower. Soon enough, the sun descended behind the mountain and we were able to hang out in our campsite without getting roasted. We cooked up some dinner and relaxed some more. The weather report said that it was supposed to be up in the eighties the next day, which made Vicki a bit worried. She doesn’t tolerate heat very well. We had brought our water sprayer for this very purpose (essentially a hand-held swamp cooler) but she still wasn’t happy. 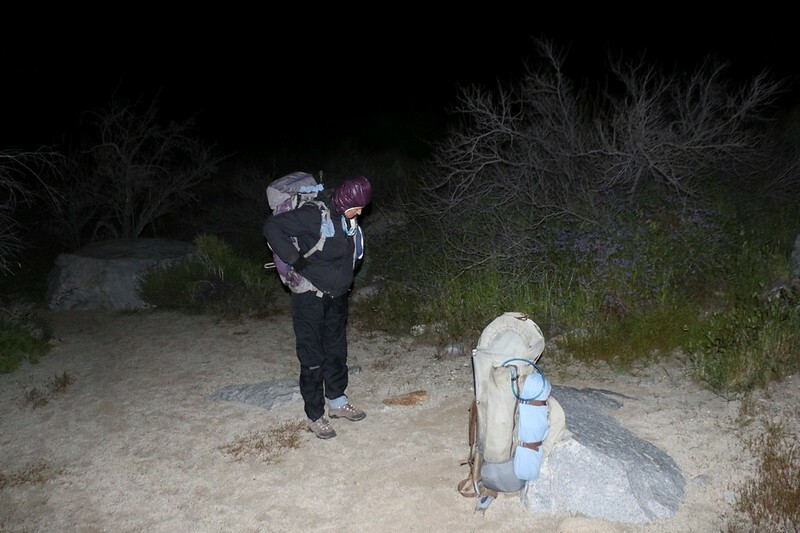 We decided that we would wake up in the early hours of the morning and hike out in the cool of the night. The moon had been full only two days previous, so we’d probably be able to do it without our headlamps. We both liked this idea. So I set the alarm and we went to bed early, before the sun had even set. I’m not certain why, but instead of waking to the alarm at 3am, Vicki woke up at 2am! And she was wide awake. So was I, for that matter. Maybe it was all those naps the day before. Just maybe. We tried to go back to sleep but it didn’t work. Finally, we both said “The heck with it!” and woke up for real. 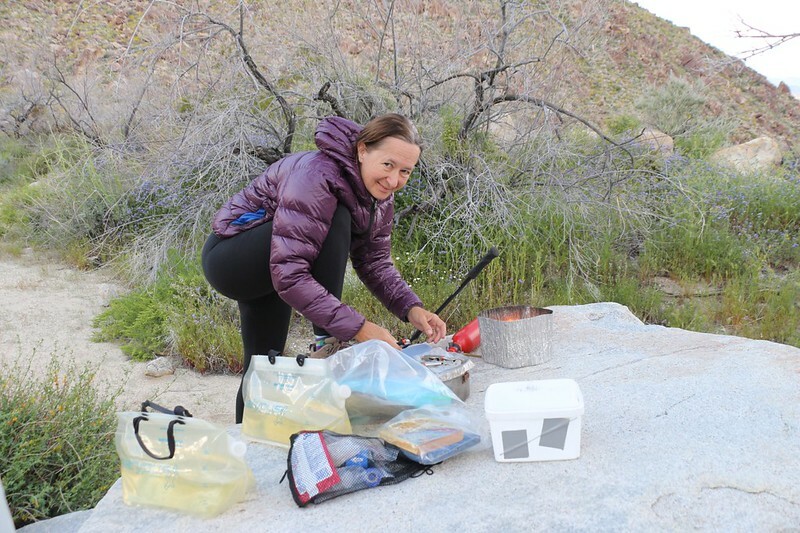 We’d originally planned a breakfast that didn’t need cooking, so all we had to do was pack up our gear by the light of our headlamps. We’ve gotten pretty good at this by now. It was about a quarter to four when we began hiking. 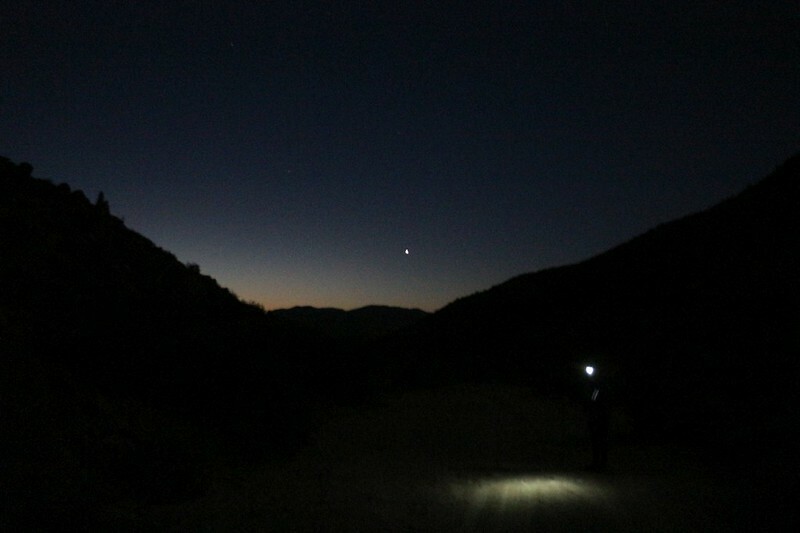 We needed our headlamps initially, on the footpath that led to Sheep Canyon (mostly so we wouldn’t snag our expensive goretex outer layer on any catclaw plants), but after that, once we were out on the sandy road, we hiked along under the moonlight. 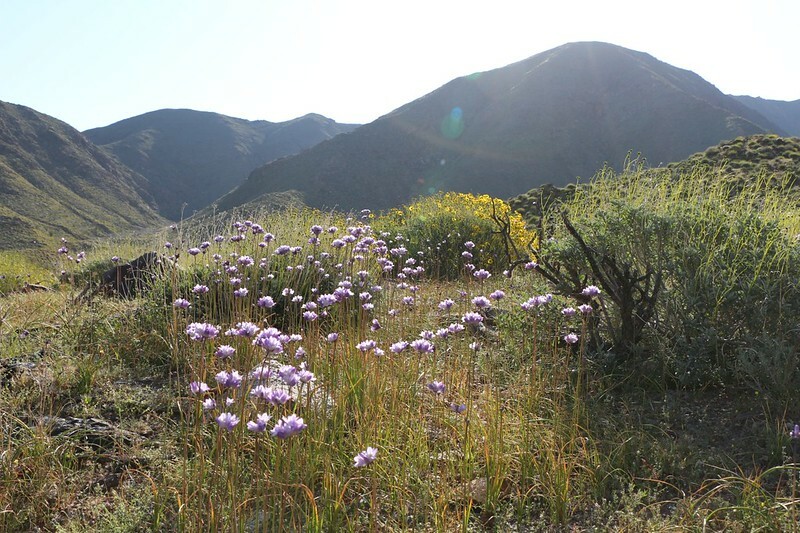 What we lost in views of the Super Bloom, we gained in the peacefulness of the desert night. It was beautiful out there. The moon was high, and the road was bright beneath our feet. The slope was a gentle downhill grade and we flew along at full hiking speed. We were making great time. Along the way we stopped to view some of the constellations we knew. 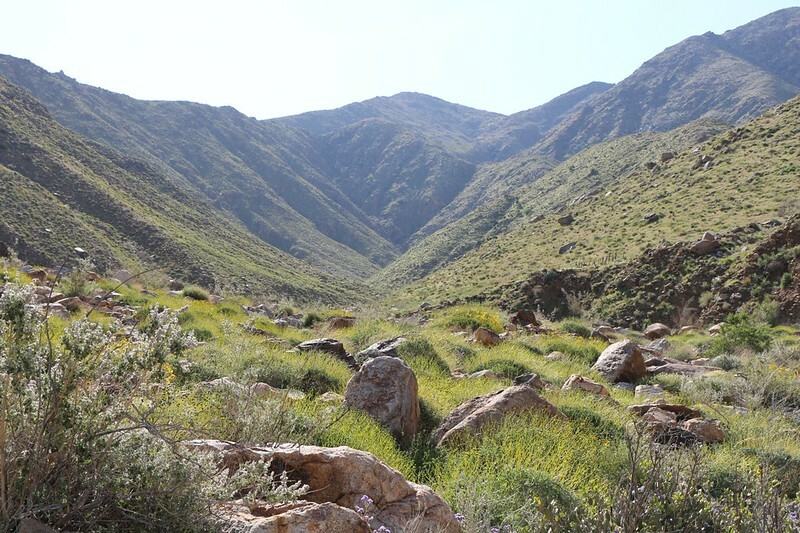 There was a continuous flow of cool air coming down out of the canyon behind us, as if the mountains were dispensing a gentle Spring blessing upon the flowers and plants of the desert. We climbed up and over the hill as we left Collins Valley, and this slowed Vicki down a bit (it was uphill, after all), but the temperature was cool enough that she had no problems whatsoever. 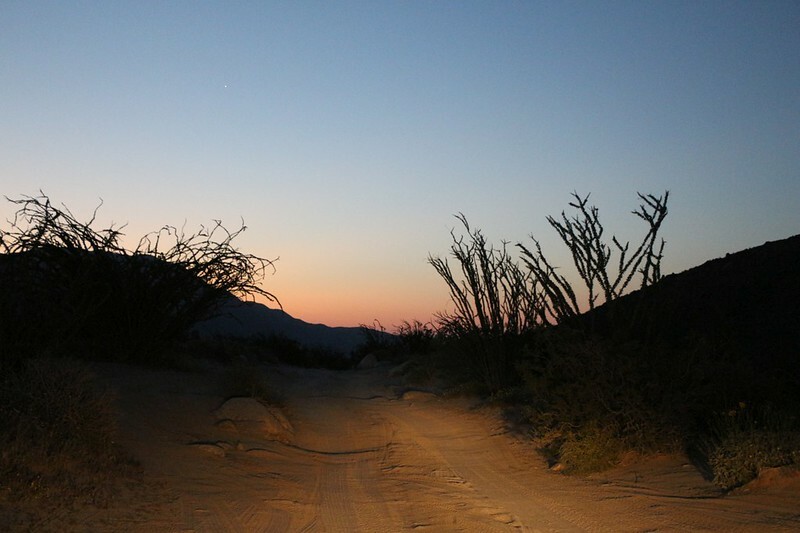 We headed down the final steep slope to the car as the dawn light continued to brighten in front of us. 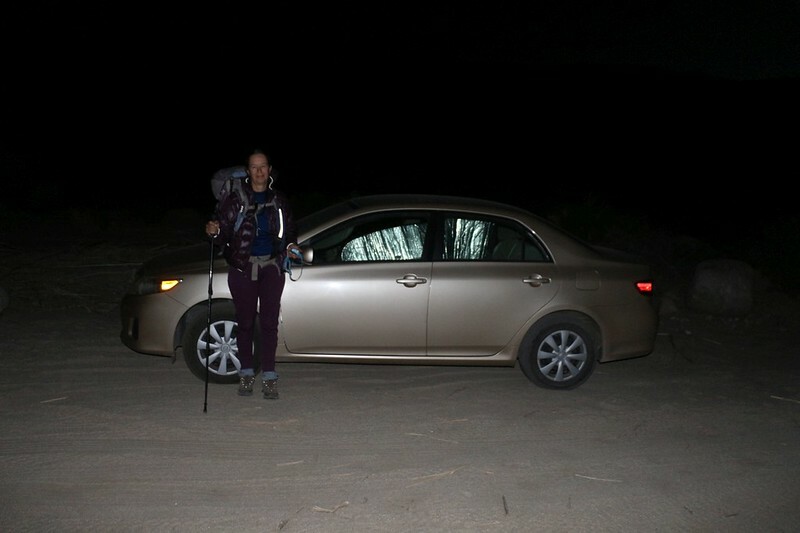 We made it back to our car by 6 AM after hiking two hours under the nearly full moon – beautiful! 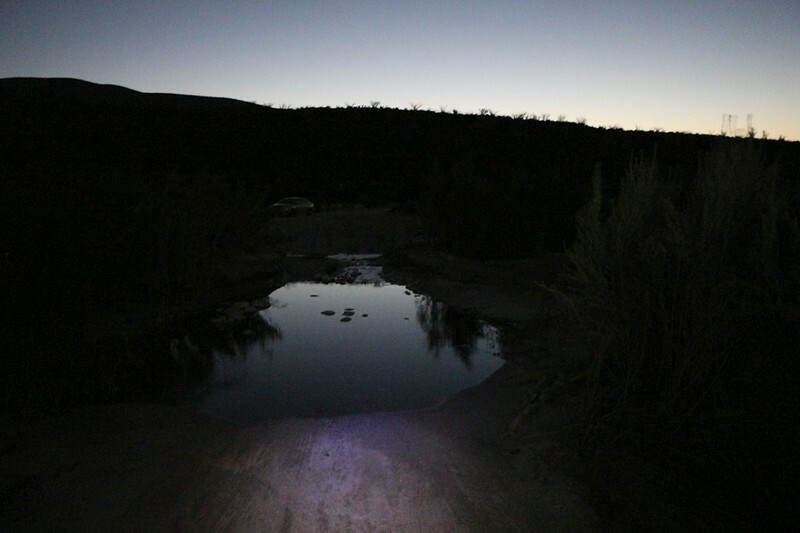 We made our way across Coyote Creek with the help of our headlamps (not wanting to get our shoes wet) and walked over to the car. It was Monday morning, and there was no one parked out there. We had seen no lights and no cars on our hike, and it’s quite likely that we had had this entire section of the park to ourselves. That’s the way we like it. 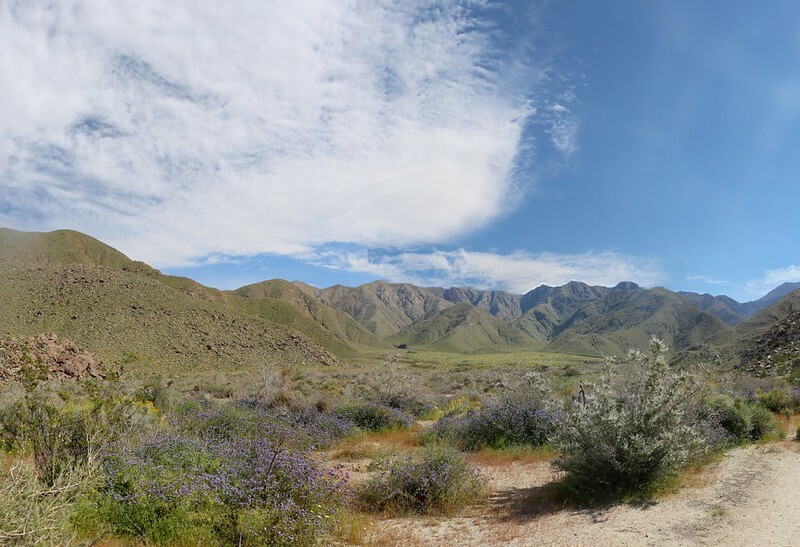 We remembered what a madhouse it had been on the way here, with all those people checking out the Super Bloom on a Saturday, and now it was like a ghost town. We stowed our gear in the car and stood together in the early light of dawn. We thought about the weekend, and what a relaxing time we had. And the flowers had truly been amazing. We were happy that we’d timed our visit to coincide with the peak of the bloom, and what a bloom it was. Probably the best one we’d ever seen. The rest of the trip’s photos and videos can be found on my Flickr Page. 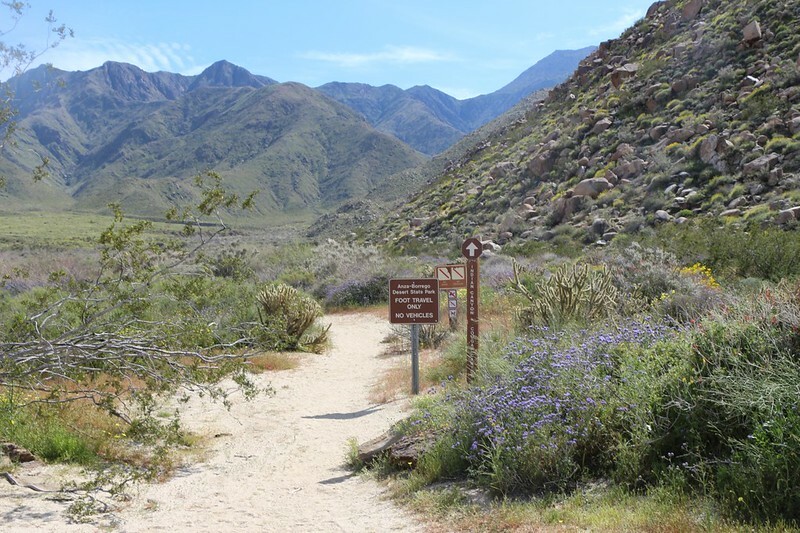 For an interactive topographic map of our hike, including GPS Tracks, please see my CalTopo Page.